The Van Cortlandt Bridge over the Croton River in 1912. Courtesy of the Westchester County Historical Society. 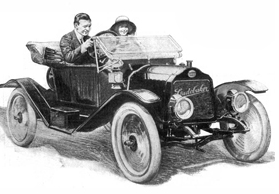 Thus equipped, you drive north on the historic Albany Post Road. 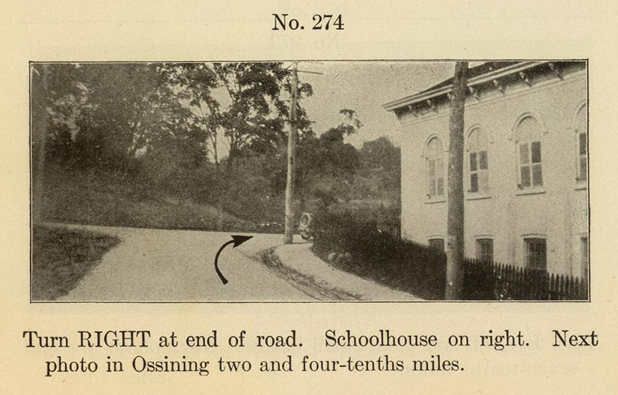 You pass through Ossining and soon come to the next landmark, a fork in the road with a brick schoolhouse on the left. You hang a left at the fork, following the road downhill, and you see a huge chimney towering over an industrial building on the right. You wonder what it is but you can’t stop to look because a narrow iron bridge looms ahead, crossing the wide Croton River. You pass the building, thinking about lunch. Should you stop at the Nikko Inn, in Harmon, or push on to Peekskill? As you zoom across the old bridge you don’t notice the person with a camera down below, who snaps a picture as you pass by. . . .
We’ll never know if this is an accurate description of what was happening when this wonderful photograph was taken, but it’s certainly plausible. 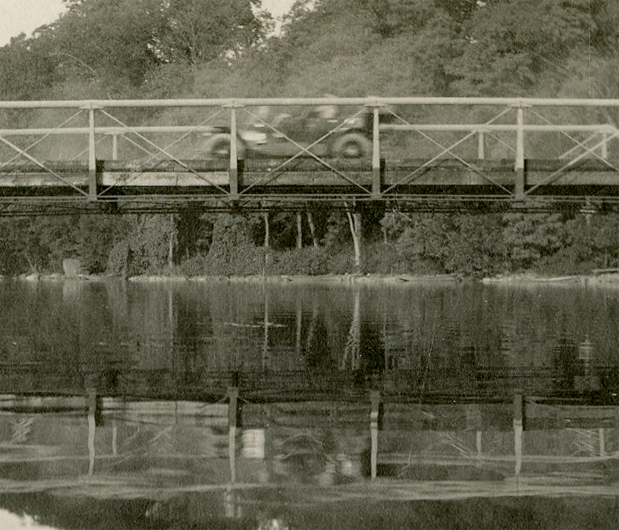 Thanks to the Westchester County Historical Society—which has preserved this “decisive moment”2 and graciously allowed us to share it—we get a rare look at what was then known as the Van Cortlandt Bridge, at the dawn of the age of the automobile. Let’s retrace the route this driver would have taken and see what the area was like in 1912, long before Route 9A and the bland “Crossining” bridge were built. Here’s a map of the area, published just a few years earlier. Detail from map 12 of E. Belcher Hyde’s 1908 Atlas of the rural country district north of New York City . . . Courtesy of the David Rumsey Map Collection. 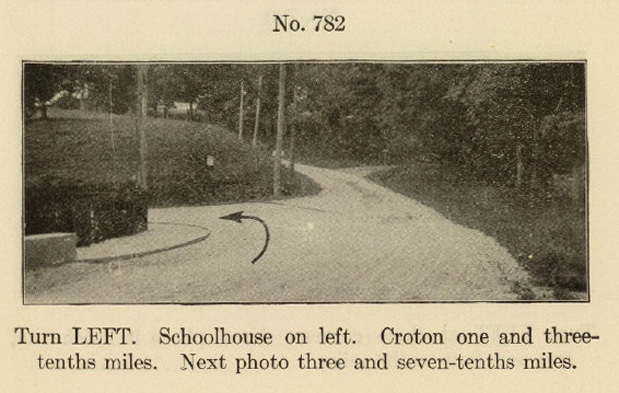 today, the road in the middle goes under Route 9A to Crotonville. (today the Parker-Bale American Legion Post No. 1597) on the right. Next is a photo of the front of the school building. If it looks familiar that’s because today the old Crotonville School is the Parker-Bale American Legion Post No. 1597 at 11 Old Albany Post Road. The road that once went down to the Croton River was was cut-off when Route 9A was constructed, but if you drive by to look at Parker-Bale (and you should) you will see a small strip of the old road surface to the right of the building. 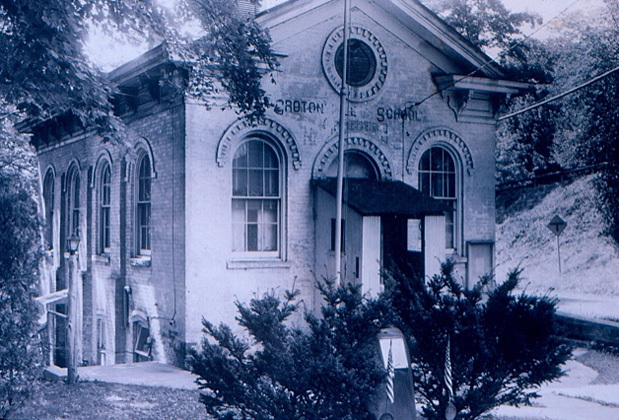 Crotonville School. Courtesy of Carl Oechsner. 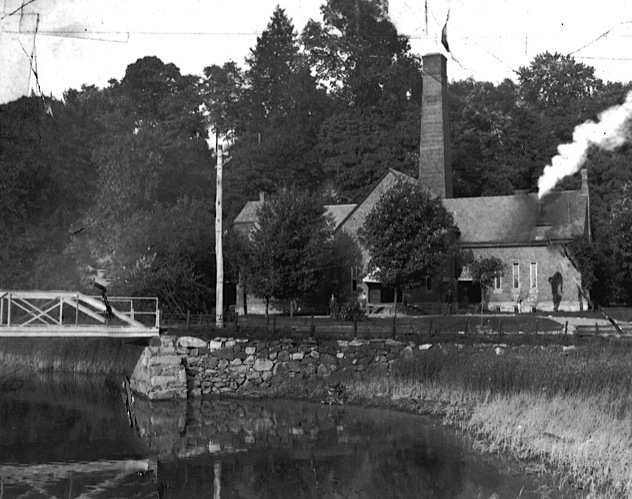 The brick building on the Ossining side of the bridge was the Croton Bay Pumping Station. It was built in 1890 and originally housed two large hydraulic engines that took water from the Indian Brook Reservoir in Crotonville (shown east of the letter “B” on 1908 the map, above) and pumped it to a storage reservoir in the village of Ossining. Today the building is owned by Anthony L. Fiorito Inc., which specializes in water, sewer and drainage services. 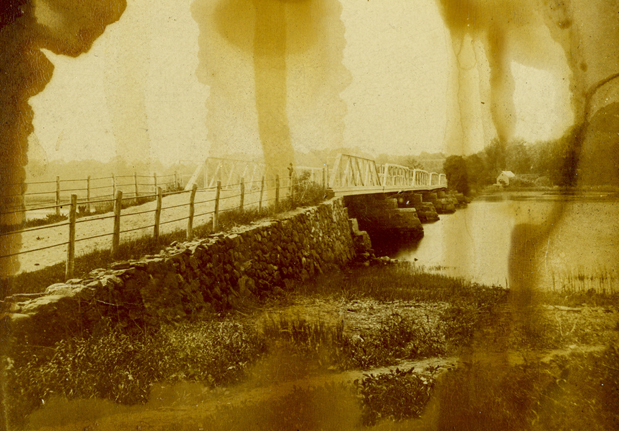 This detail from a rare, badly damaged stereoview shows the Van Cortlandt bridge from the Ossining side. in front of the Van Cortlandt Manor house. 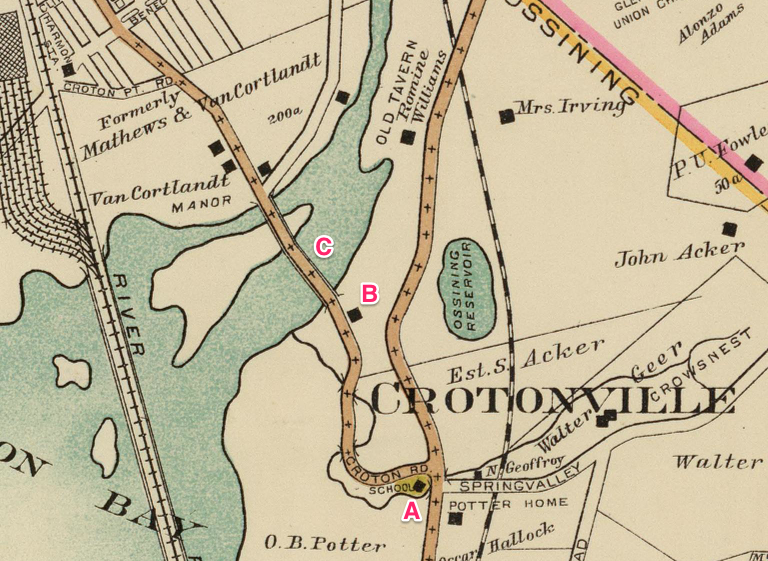 This detail from an 1871 survey of the mouth of the Croton River shows that at one point there was a drawbridge on the southern end of the Van Cortlandt bridge. The strip in the river marked with dotted lines was a channel for ships. Also note the small building at the end of the causeway on the left. This is the building shown in the stereoview above. By 1912 the drawbridge had been removed and the simple iron bridge carried early automobiles over the river until 1922 when the state removed the old span and replaced it with an elegant Beaux-Art reinforced concrete structure. What happened to that bridge? That sad story will be the subject of a future post. I grew up in the old house next to the Pumping Station in the 40s and early 50s. The house was owned by Moses Myers from Ossining. My grandparents, Bert and Maude Tompkins, lived there for many years before the both passed in 1950. My Mom and Dad (Lucille Radcliffe and Reed P. Tompkins) moved our family to that house right after my Dad returned from the Navy in 1946.